You've heard that myfamily is most important to me. That my hero is someone who can beoptimistic at the worst of times. That my dreams for the future involvelove, peace, family, friendship, and happiness. That my greatest strengthis listening. You know some of my most personal thoughts and feelings. And now, you will know why I believe those things and how I got to them. Although I don't think about it on a regular basis, I do live every daywith the thought that I am only as strong as the people I surround myself with. As much as I think I am introverted and independent in the sense that Ikeep things to myself, I am not. My number one priority – above work and school – are the relationships Ihave. To me it doesn’t matter ifits 3 AM and I have a 20 page paper due the next morning. If a friend called me crying, confused,or just needing to talk, I drop everything. I’ll stop working and talk to them and be there for them. I do it because I love them. I do it because they need me. I do it because they come first, aboveeverything else. I do it because Iknow one day I’m going to be making that call myself and I know that someonewill answer. It’s really hard forme to express myself and share my emotions. I hate the feeling of being vulnerable and weak. But at the end of the day, it’sokay. Because I don’t always haveto be strong. I can’t always bestrong. And when I can’t be strongfor myself because I’m always being strong for so many other people, it isn’tthe end of the world. Therelationships I’ve built over time are strong for me instead. They are the people who hold me when Ican’t stand up on my own. Thepeople who push me forward when I can’t take those first steps. The people who carry me when I can’tget there on my own. Without themI don’t know how I would get from one day to another. 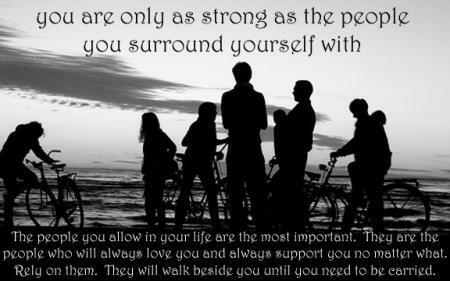 If I didn’t have different people to rely on emotionally, I don’tthink I would be the strong person that I am today. Find those people. It doesn’t matter if it’s one person or one hundred people. Find them and word hard at keeping themin your life. They need you, and someday, you will need them back.